--Stefan: The material on these pages comes from five messages, posted on r.g.g. by John Fairbairn on 4th November, 2001. He has agreed that they are reproduced here. These extracts from his notes are untidy and unchecked. As with many things on SL, they are probably too rough at this point in time to be of optimal value for the reader who's after a discussion of the topic. But as always, we need to start somewhere, and this looks like an excellent starting point. The epitome of fuseki in the Meiji era was summarised in Hoen Shinpo (1882) by Shuho, viz, Diag. 1 p. 209 which Shuho said is best for both and would lead to a close game. After Shusai, fuseki became more rigorous. By Showa the best style of play was as represented in Diag. 2 p. 210. The differences here are the full extension to 15 rather than just r12, and the high extension 18 rather than k3, designed not just to make the extension work more efficiently but harder - it is a partial defence against an invasion at r7 (it also offers a nice developing move to g5). Black's 21, 23 and 25 forcing moves are close to "harmony breaking" too. These are things rarely seen in Hoen Shinpo. Fuseki was therefore becoming not just more rigorous but faster. This period was heavily under influence of the Shusaku style still. But White was trying to find ways to combat it. 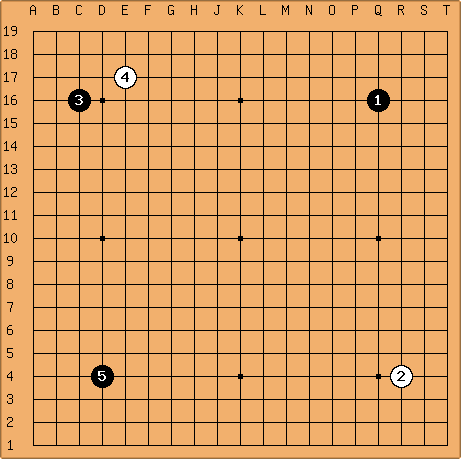 Ways included d16 for (Shuei-style). and playing taisha in the lower right (Diag. 3 P. 211). This spread the game out somewhat, which, while not exactly to Black's disadvantage, was not to his taste. He therefore tried his own countermeasures, which mainly included being more severe on by using the one-space pincer n17 (today similar but preferred is m16 - a in diagram below). at d15 was felt to be good against Shusaku, at least in the sense that it gave a confusing game. So Black tried to counteract this by playing at p16, and this was popular for a while, but it was felt difficult for Black to play d17 (a in the diagram) and maintain any sensible connection between this move and the upper right shimari (unlike at d16 where f17 is OK for Black). (3) Shusai-style - at r4, which certainly flouted traditional dogma. The high approach at o16 was the most interesting in terms of development into New Fuseki. This was popular as early as Shuei, but (like hoshi) especially in handicap games. It became studied a lot in the early Showa era to the extent that it could be called New Joseki. The high position of was seen as being beneficial if confused fighting developed (as White wanted). Black could meet with a but has the feeling of being forced and this is inferior to b, at c. But if he ignored , White at d was seen as very severe. Therefore Black sought countermeasures, which included at e and at f. The latter in particular became a spur to New Fuseki. Incidentally, at o17 was also commonly tried but this went back to Sansa's days, and again Black tried various measures rather than be forced by playing a. There were thus four impulses in early Showa that led to New Fuseki: (1) more rigorous moves; (2) confused fighting; (3) high position/speed of development; (4) it was a period of intense experimentation..
Of eight complete games from the Oteai published by Kido in Spring 1929, when Black played at r16 in each case, White played o16 against it in four cases and o17 in one (none involved Kitani or Go Seigen). One two-stone game also involved on the centre point. It was too a time of social unrest in Japan - unhappiness with politicians, the crime rate, morality, break-up of the family. There were political assassinations and even a famine in North Japan. All in all there was a psychological need for change and renewal. Das Kapital appeared in Japan in 1920 and this had an impact. Yet a further impulse was an increasing interest in the go of China and Japan through visits by people like Takabe Dohei onwards. The starting stones gave ideas, especially for Black to play on star points - for White this was known from Shuei, but not with Black. The weaving of the strands into the full cloth of the New Fuseki had however to wait until 1933. Go Seigen was not experimenting - he stuck to Shusaku - but his brother was. In a game for Waseda University in November 1930 Wu Huan played d16 against a player from Meiji University. It merited enough attention to be commented on by Takahashi Shigeyuki who said could not be called good or bad but using the star stone was the most difficult strategy. This Black 1 began appearing a lot from 1931 and White often responded with a hoshi of his own, so games became a battle of influence. On example is Black: Iida Haruji 3d v. White: Kawai Kikuji 3d in the Spring Oteai of 1931: Q16 R4 C16 E17 D4 - and these were two players regarded as veterans! Possibly the first occurrence of 3-3 was in December 1926 by Shinohara Masami 4-dan (Black) v. Miyasaka Shinji in a Special Ki-in Championship game. Their opening began: R16, E17, P16, R4, C3. It was not castigated - Black got a difficult game but it was felt he had not fully absorbed the features of the new move. In a commentary on a game where Kubomatsu played 3-3 in 1929, Honinbo Shusai, who one would expect to shore up the old guard, simply said " would normally be takamoku at a." In April 1933 Go tried the 3-3 point in two corners against Mukai Kazuo. This was still not regarded as New Fuseki. But from Spring 1933 to Summer 1933 he played double 3-3 in seven games and double hoshi in eight. Wu Huan had tried 3-3 as White in a game in 1930. For completeness, among the other unusual tactics tried at the time, Takahashi Shigeyuki 3-dan played r10 against Shinohara Masami 4-dan in 1928 and Hashimoto Utaro 4-dan played, after R16 E17 P17, R6 against Mukai Kazuo 4-dan in 1930. There was of course also a spate of new moves in joseki, especially the Avalanche, two-space high approach top attachment and taisha, and pressing moves (kake) were especially popular in a bid to win influence. The big event was Jigokudani - a combination of several things - romantic name, journalistic flair (cf. Silicon Valley) and the close to the top two players. The hot spring is in Yamanouchi town, Takai District, Nagano Pref. Kitani had married the eldest daughter of the Shibano who kept the inn there two years before and went there on a working holiday - the work was to write a book with the go writer Kohara Masahiro (is this the son of the 5-dan pro of that name?). "Because Kitani was writing a book called 'Integration of Fuseki and Joseki' on holiday there, he was immersed in various researches. In that book he wanted to express new ideas about fusekis based on influence. Basically Kitani was very fond of the games of Yasui Senchi (Yasui VII, Senkaku - O-Senchi) whose spectacular go style was rich in influence. The games of Kitani himself at that time also showed that influence. During this time, I was killing time without doing anything special and had no connection until then with Kitani's researches. When I say up till then, it was when I received two or three opinions from Kitani on new fusekis. While listening to the various things he said, I felt a strange sort of interest in his ideas. Even now when I recall it, I still do not understand why I felt such an attraction. In my actions up till then I could not say there were any essential elements that made me receptive to new Fuseki. To exaggerate, perhaps it could even be called a sign from Heaven. Actually the situation was that I concurred with Kitani's views, but the reason my disposition agreed to that extent was perhaps after all that my karma in no small way was disposed to New Fuseki." 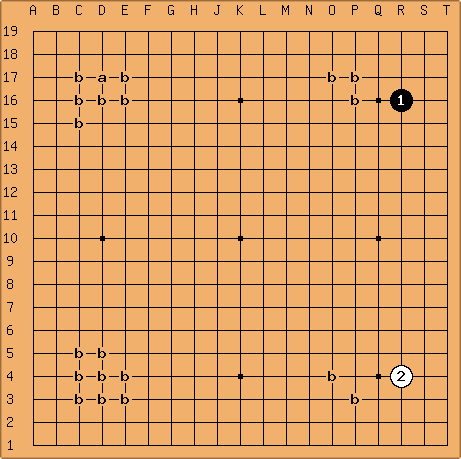 Go had already played hoshi and 3-3 hitherto but their conception differed from New Fuseki. Kitani's idea was "influence" and Go's was "speed" and one feature of New Fuseki was preserving the precarious balance between them. That idea is also what has passed down from New Fuseki to today. "There is a game that sandwiched this trip to Jigokudani of special interest that explains the instant New Fuseki was born; so I will give it. The fuseki of this game even now I can recall easily. It was Game 5 of the 10-game match with Kitani for Jiji Shinpo (Go was Black). It was in the summer of 1933, just before the trip to Shinshu. It began Black 1 and 3 at the two 3-3 points. ShinFuDiagPg231 In White's play we can already see Kitani's fondness for influence - White 2 and 4 mokuhazushi and White 10 and 12 etc. This game was suspended after Kitani's move . The continuation was set for a month later and we set off for a holiday. After the trip to Shinshu I returned after 4,5 days. Kitani stayed there and returned to Tokyo about a week later. The game then continued and the first move of the continuation was Black 27! If I had not gone to Shinshu I think I would probably have chosen to invade at k4." Go won the game and Kitani said afterwards (?) was a/the losing move: it let Black approach at 29, just where White would want to play in this game. Probably it was owing to the impact of this game that Kitani started playing 5-5 a lot. There was a dispute later between Ezaki Masanori, a go writer and biographer of Go Seigen, and Yasunaga Hajime as to whether the birth of New Fuseki was "by chance" or "inevitable." Ezaki stressed the chance meeting of the two players but as we have seen there was a lot of inevitability about it. On his return to Tokyo, Kitani tried the new style for the first time in newspaper go. This was Diag. 1 (the name sanrensei was first used then) and 7 and 9 were high. But he lost this game. He then continued in Game 5 (?) of the 10-game match with Go and played sanrensei again against Onoda as the 5th man in the Hochi Win-and-Continue tournament but lost as Black. But he was resolute and tried again in Round 1 of the Oteai with White against Hasegawa. He won. 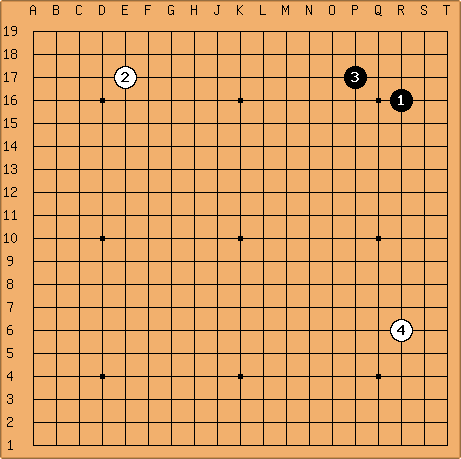 Sanrensei had become a talking point and it was said that Hasegawa had prepared against it (Black 5 on the side). But Kitani won decisively. Go Seigen was deprived of an opportunity to try New Fuseki in Round 1 of the Oteai because he had a walkover after default by Segoe, so this Kitani-Hasegawa game is the first in what was then seen as top-level play. In Round 2 Kitani lost, against Takahashi Shigeyuki. Of more significance was Go's Round 2 game against Kosugi Tei, because the for first time both sides played New Fuseki. This was the famous Sixteen Soldiersgame (October 1933). Kosugi had already tried tengen in 1929 and so was disposed to new fuseki but was reluctant to follow New Fuseki to extremes. In Round 3 he played Kitani and again tried 3-3 twice but said afterwards he was only "countering the irregular with the irregular." Re the Kitani-Takahashi game, in the book 'Down with New Fuseki' (Datou Shin Fuseki) co-written by Takahashi with Murashima two years later (1935) appeared the first serious opposition to New Fuseki. In the game Takahashi played old style (two shimaris, ryojimari) and won. The loss for Kitani meant he missed 2nd place in the Oteai. 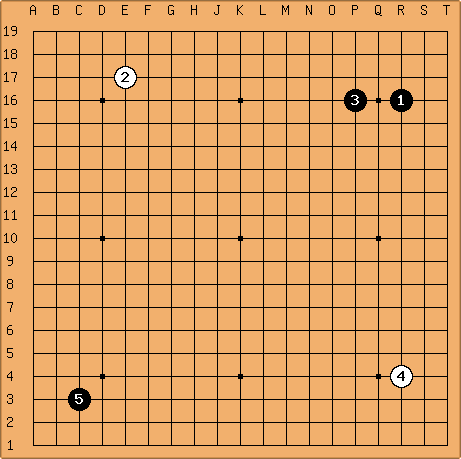 But Kitani and Go Seigen were putting up impressive results and other pros had to take notice of New Fuseki. In this period Kubomatsu, so long known as a proponent of tengen, played it only once, in a game against Kosugi Tei in Oct 1933 (Rd 4 of Oteai). Dave - This is an interesting comment about traditional dogma. The reason is that GoGoDCD lists a total of 257 games in which this is used to answer . The earliest is from 1666 - Yasui Chitetsu (White) versus Dosaku. Almost all of the big names in the classical period in Japan tried it. Before Shusai, Honinbo Shuho also regularly employed it. It appeared in every decade of the twentieth century. So how much do the pros care about "dogma"? By the way, in the games shown, a is the most frequent choice for Black 3 (110 out of 257 games). However, this pattern is quite diverse and a total of twenty different responses are shown - all of the points marked b have been tried at least once in professional play. Charles Matthews I think the dogma in question here is that it was considered good for Black to get the second 3-4 point in the upper left. One can detect echoes still of this kind of teaching in Otake, and I believe Michael Redmond too, who likes orthodox, classical go.